New Zealand has dropped from 14th to 46th in a ranking of attractiveness to energy investors. This isn’t surprising after the Government put significant limitations on oil and gas exploration. ‘Green’ or alternative energy prospects don’t seem to rate – I’m still unclear how we will meet al our energy needs if we transition away from fossil fuels completely as some want. An annual survey of the world’s leading oil executives, which ranks the ease of investment into oil and gas producing countries, shows New Zealand has dramatically dropped down the list in terms of its attractiveness to investors. The Fraser Institute, which has run the survey every year for 12 years, asks executives to rank provinces, states and countries according to the extent to which barriers to investment in oil and gas exploration and production are present. New Zealand’s attractiveness to investors has dropped from the 14th highest country/region to 46 in the space of a year. “This drop is based on poorer scores with respect to political stability, environmental regulations and protected areas and taxation in general,” the report said. National’s Energy spokesman Jonathan Young put the blame for the drop squarely in the lap of the Government. In April, Prime Minister Jacinda Ardern banned future offshore oil and gas exploration in New Zealand with the exception of Taranaki. The ban took the industry by surprise because it was not part of any confidence and supply or coalition agreement and had not been explicitly promised by Labour during the election campaign. According to some industry players surveyed in the Fraser Institute report, this was a key reason for the drop in New Zealand’s attractiveness. “New Zealand’s move to ban new offshore exploration is a deterrent for investors,” one said. “Jurisdictions that are openly hostile towards resource development, like New Zealand, cause investors to take their investment dollars elsewhere,” said another. Young was not surprised by this and said the ban had “scared off” potential investors and would cost the economy tens of millions of dollars. It’s not surprising – it looks like to an extent at least it was the intent of the ban, or it must have been at least a predictable consequence. Hardly. The Government has limited fossil fuel exploration possibilities, but I have seen little of the other side of the equation – alternatives. Climate Change Minister James Shaw was not surprised by the survey. He said because oil and gas exploration was being phased out in New Zealand, there was not actually much more investment in the sector that was needed. Shaw needs to come up with a credible path to sufficient alternative energy to replace fossil fuels, otherwise we will either have an energy shortfall, or will have to rely more on more expensive imports of fuel. I’d love to see polluting fuels phased out, but I would also love to see a realistic and viable plan for what will replace them. At the moment I see little more than pie in the sky idealism. Energy of dreams – ban them, and alternatives will come. Maybe. Gareth Hughes has had a low profile as a Green MP for some time, but he is upping his efforts to end oil and gas exploration. A supplementary order paper from Green MP Gareth Hughes threatens to rip the scab off the Government’s contentious ban on new offshore oil and gas exploration. The Government announced an end to the issuing of exploration permits for offshore oil and gas exploration in April. The ban did not affect existing permit holders, who were free to continue extracting oil and gas. But as backlash mounted against the ban, the Government granted a significant concession to exploration companies. Hughes has used a supplementary order paper (SOP) to try to overturn Woods’ decision. An SOP allows MPs to amend legislation that is currently before the House. But the proposal has come at an awkward time for the Government. A perfect storm of catastrophes has exposed just how reliant New Zealand is on gas. Unseasonably cold weather and low water levels at the South Island’s hydro-lakes has meant electricity generators have had to use gas and coal. Unfortunately, two outages at the Pohokura gas field and essential maintenance on the Maui pipeline has meant New Zealand’s gas resources haven’t been ready to pick up the slack left by depleted hydro-lakes. This has sent wholesale electricity prices soaring .The average wholesale price for most of October was $300 per MWh. Last October the average was just $102 per MWh. I use Flick for power. They are usually quite reasonable, but my last two power bills have jumped up, with one over double the previous week ($100 for a week). Hughes says the loophole means offshore drilling could continue indefinitely, defeating the purpose of the ban. He has called on Labour and New Zealand First to back him. “The whole point of ending future offshore permits was to ensure a smooth transition away from fossil fuels. To extend existing permits defeats the purpose,” he said. But due to us being far from reducing our dependence on fossil fuels a reduction in gas recovery risks forcing us to use less clean energy, and forcing us to import more fossil fuels. Green MP Gareth Hughes has made it clear that he and the Green party disapprove of a concession given to the oil and gas exploration industry, as announced by Minister of Energy Megan Woods. “This is a special day for the planet, and proof that this Government are now meaningfully acting to address climate change”, Green Party energy spokesperson Gareth Hughes said today. “This is Greens in Government at its best and represents an important step to stopping new offshore permits, so that our environment is better protected. “We’re looking forward to the upcoming wider review of the Act. We will push hard to change the purpose of the Act so that exploration is ‘regulated’, not ‘promoted’ by this Government. Mining companies with existing licenses for drilling have a time limit on when they can explore. If they reach the time limit, their permits are handed back to the Crown. Oil drillers shouldn’t be offered special treatment to extend or waive that time limit. I struggle to see the point in banning offshore exploration for oil and gas if existing companies with huge blocks can hold off from exploring until way later down the track. 7. 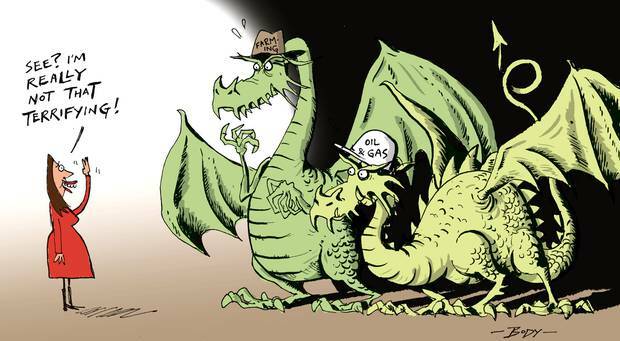 GARETH HUGHES (Green) to the Minister of Energy and Resources: Does she stand by her reported statement that she will “consider giving the oil companies more time to fulfil their commitments on the permits”; if so, which permits are currently facing a “drill or drop” decision in the next two years? Hon Dr MEGAN WOODS (Minister of Energy and Resources): Yes, I am in discussion with officials regarding the possibility of exercising my statutory powers, as the responsible Minister, to make changes to petroleum exploration permits. Any such change would be made on a case by case basis under the current law. There are 16 permits with “drill or drop” decisions in the next two years. More information about all active petroleum exploration permits, including “drill or drop decision” points, is publicly available on the New Zealand Petroleum and Minerals website. As the member is aware, our Government is committed to a long-term transition away from reliance on fossil fuels, and the introduction of legislation this week reflects exactly that commitment. Gareth Hughes: Does she stand by the Government’s historic decision to halt offshore oil and gas exploration, and if so, does she think a long tail of up to 16 active permits undermines this decision? Hon Dr MEGAN WOODS: In answer to the first part of the question, yes, and in answer to the second part, no. As we’ve been clear, the Government is committed to a long-term transition away from fossil fuel exploration and a clear plan for our future. We’re achieving this by issuing no further offshore exploration permits, while also protecting the existing exploration permits that cover 100,000 square kilometres, to enable a smooth transition over the coming decades. This is a sensible approach that allows regions, communities, industry, and the workforce a just transition to a low-carbon future and avoids sudden economic shocks like we saw in the 1980s. Gareth Hughes: Does she agree with recent comments by our climate ambassador Jo Tyndall that this Government has sent a clear signal to industry that we are phasing out oil and gas extraction, and if so, does relaxing the work programme deadlines on permits undermine that message? Hon Dr MEGAN WOODS: I do agree and am proud that we are ending offshore exploration and are committed to a just transition, and we’re not relaxing those conditions. Gareth Hughes: If the Minister grants extensions to any offshore permits, will she limit their duration, and if so, what time frame will she use? Hon Dr MEGAN WOODS: As I indicated in my primary question, each of these needs to be on a case by case basis, and I will consider those applications on a case by case basis. Gareth Hughes: Will the Minister commit to passing more wide-ranging changes to the Crown Minerals Act (CMA) this term to ensure New Zealand does transition away from fossil fuel extraction? SPEAKER: Order! Order! That’s enough. That’s enough. Hughes is the Green Party spokesperson for Energy & Resources. It seems odd that he hasn’t been closer to Woods and what she is doing and announcing on this – has she ignored Hughes and the Greens? Surprisingly there is no mention of fossil fuels or oil and gas in the Labour-Green confidence and supply agreement. Being in Government means we can deliver on our Confidence and Supply Agreement – but it also means so much more. For instance, we got an end to new exploration for offshore oil and gas – yet this wasn’t covered in our agreement. It seems that they didn’t get as much as they thought they had. It appears that the government has backed off a bit on it’s contentious ban on new oil and gas exploration, which was applauded by environmentalists and slammed by Taranaki business interests in particular. Is has been pointed out that it could lead to higher carbon emissions as more alternatives were sourced from overseas. After all the hype, the Government’s troubled path to ending new oil exploration has a bizarre sting in the tail: a bit of a backdown. In the hours before she announced a law change to give effect to decisions announced in April, which mean no new offshore permits, Energy Minister Megan Woods met with the industry to deliver a piece of good news. Oil explorers facing deadlines on their permits to either commit to exploration wells or relinquish the permits – referred to as “drill or drop” – are likely to be given more breathing space. It seems the deadline to drill could be pushed back for years, although Woods has not given details other than that she will consider giving more time on a case-by-case basis. In terms of concessions, it looks like no big deal, given the Government is changing the legislation that frames the sector. No-one in the industry will celebrate this as a victory, given the overall impact of the moves by the Government. But it seems like Woods is trying to head off a potentially major “what if?” headache. Although the odds of success are put at only one in five, NZOG has claimed that, if successful, Barque could transform New Zealand’s energy outlook, with thousands of jobs and tens of billions of revenue. Seen this way, Woods’ gesture to the industry looks like a major contradiction of the Government’s plan, to set New Zealand on a renewable future. Both Greenpeace and the Green Party are furious, with the Government’s partners warning it waters down the moves made so far. Given where we have come from, the latest move should be no surprise. On a sunny day in March, Ardern walked down the steps of Parliament to greet Greenpeace activists, delivering a major shock that the Government was “actively considering” their call to end oil exploration. Although her speech was more symbol than substance, it was clear major plans were afoot. As it turned out, the Government was not really considering anything, and it certainly did not want much in the way of advice. Less than a month later, Ardern would lead a group of ministers into the Beehive theatrette to announce the decision, giving the impression that ministers had considered the matter. In fact, all that had happened was that the leaders of Labour, NZ First and the Greens had reached a deal. Cabinet had no input in the decision. Officials were so furious at being sidelined from the decision that it was leaked, spoiling Ardern’s plan for a dramatic announcement at Victoria University. Greenpeace and the Green Party furious. Officials furious. Officials furious. It looks like this was rushed and bungled. It should be remembered that this advice comes from bureaucrats who have not only been ignored in the actual decision-making, they are giving advice on a decision that could kill the sector they work in. Seizing on the fact that – as in all long-term forecasting – the report on the oil exploration decision outlines a vast range of possibilities of the cost (from a few hundred million to more than $50 billion), Acting Prime Minister Winston Peters dismissed it as a “very, very bad piece of analytical work”. It is fair to say that the official advice offers no accurate guide as to what the fiscal cost of the decision would be. Given that we do not know the future for carbon prices, oil prices or interest rates, there is no way we could possibly know what that cost would be, a fact which seems lost on Peters. What we do know is that there will be a cost, and it will likely be significant. We also know that the way it was handled has had a significant impact on investor confidence in New Zealand, which seems to have dawned on the Government only months later. It is also likely to have an impact on energy prices, both from the cost of gas to households and its impact on future electricity prices. Woods said on Monday that, even with the benefit of hindsight and advice, she would still push for exactly the same decision. Of course, she would say that. But it seems the Government has decided to breathe a little more life into oil exploration, just in case. The Green Party does not support Labour Party Minister Woods allowing mining companies with existing offshore oil and gas exploration permits more time to consider if they will drill. “Mining companies with existing licenses for drilling have a time limit on when they can explore. If they reach the time limit, their permits are handed back to the Crown”, Green Party energy spokesperson Gareth Hughes said today. They shouldn’t be offered special treatment to extend or waive that time limit. “I struggle to see the point in banning offshore exploration for oil and gas if existing companies with huge blocks can hold off from exploring until way later down the track. “New Zealand took an incredibly exciting and brave step for people and planet when we decided to ban future offshore oil and gas exploration. “It has been congratulated world-wide and New Zealanders are proud of the decision, let’s not water it down. “I am urging her to reconsider this proposal”. Remember Gareth Hughes? I’m not sure how much clout he has. He is till an MP but is far from prominent. While Jacinda Ardern is getting celebrity attention in New York the cost of reality hits home here. Government officials have estimated that the cost to New Zealand of banning new offshore oil and gas exploration permits will be $7.9 billion between 2027 and 2050. The advice is contained in a just released regulatory impact statement (RIS) by officials from the Ministry of Business, Innovation and Employment. It was previously known that officials opposed the move, but the estimated cost to the Government is new. The $7.9 billion estimate is the midpoint of a series of estimates that vary widely with different variables but represents a medium exploration scenario. Foregone revenue to New Zealand could be higher under high exploration, $14 .3 billion, or as low as $2.7 billion with low exploration. But Energy Minister Megan Woods contests the estimates. Woods’ statement also said the model used for estimating the cost was unable to take into account any potential from existing exploration permits, covering 100,000 sq km. The new advice has been released alongside the Crown Minerals (Petroleum) Amendment Bill which gives effect to the ban announced in October by Prime Minister Jacinda Ardern, Regional Economic Development Minister Shane Jones and Climate Change Minister James Shaw. Ardern’s stance that New Zealand prefers an “evidence based” approach to drugs is a direct challenge to the US administration’s rhetoric on the issue, and it is not the only area where both countries are increasingly talking a different language. I wonder what evidence they based their rushed decision on banning new offshore exploration. Prime Minister Jacinda has said it is “an absolute given” no announcements should be made by Ministers before Cabinet discussion – except when it is “normal decision making process”. After Andrew Little had to scrap his plans to scrap the 3 strikes legislation when it became obvious NZ First wouldn’t support it, Prime Minister Jacinda Ardern made it clear Ministers shouldn’t make announcements before discussing them in Cabinet. Prime Minister Jacinda Ardern told reporters it was a “given” that ministers did not make announcements before discussing them at Cabinet. “There’s always a given that we wouldn’t do that. It’s something that doesn’t really need requirement to be repeating. It’s an absolute given,” she said. “Three strikes makes up only a very small part of a much wider agenda and we are continuing to pursue that agenda as a Government. None of these decisions are finalised until we have that discussion as Cabinet. All our ministers know that,” Ardern said. Ardern is a bit liberal with her use of ‘absolute’, given her announcement (along with a Labour minister, a Green minister and an NZ First minister on oil and gas exploration permits without discussing it with Cabinet. Cabinet has made no decision on ending oil exploration, documents being released today will show, with April’s announcement made on the basis of a political agreement between the coalition parties. Although the news was delivered by ministers affected by the decision and in a forum usually used to discuss decisions made by Cabinet, politicians made the decision in their roles as party leaders. Today the Government will release a series of documents generated in the making of the oil and gas exploration decision, but it has already confirmed to Stuff that no Cabinet paper was created and that Cabinet has not voted on the matter. “There was no Cabinet decision,” a spokesman for Energy Minister Megan Woods said. In a statement, Ardern defended the handling of the decision, but said it was not how most decisions would be made. “The decision on future oil and gas block offers was a political decision made by the government parties. It was consulted on and agreed between the parties and taken to Cabinet for confirmation,” a spokesman for Ardern said. An “absolute given”that ministers did not make announcements before discussing them at Cabinet except when it was part of the “normal decision making process” that is “the exception rather than the rule”. Theoretically in New Zealand’s democratic system the Cabinet of the day makes Government decisions. But when governing arrangements are made before the Cabinet has been formed decisions are effectively made by party leaders and whoever is a part of their decision making processes. It is being reported this is what happened with the decision to end the issuing of oil and gas exploration permits, but that was not a specific coalition or confidence and supply agreement. Cabinet was not involved in the decision anyway. The spokesman added that there was no requirement for Cabinet to make a decision, but a Cabinet paper would be developed on implementing the decision. There has been justified criticism of making a decision that potentially could have a major impact before spending time considering and deciding how it might be implemented. So some major decisions are made by three party leaders and their negotiating teams, with Cabinet expected to just ‘confirm’ it – that sounds like rubber stamping. In this case it seems that the Minister of Energy, Megan Woods, was instructed on decisions made outside her Ministry. A spokesman for Ardern said the exploration permit announcement was usually made around the time of the oil industry summit and “had nothing to do with the Prime Minister’s trip to Europe”. Just a lucky coincidence for Ardern to be able to take the decision with her on her European trip. Perhaps big decisions being made by Government party leaders is a practical reality of our form of MMP democracy, but it does have risks of diktat be a self selected few. This is a particular risk when a new Government is formed, and the checks and balances seem alarmingly limited. It is unlikely a newly appointed Minister would feel free to speak up against an imposed decision. In the case of the oil and gas decision, going by the obvious discomfort shown by Shane Jones at the announcement, the cessation of issuing of exploration permits seems to have been a decision made by two party leaders and imposed on the other party in Government with just a whimper in protest. Matthew Hooton is suggesting that James Shaw has done no Cost benefit Analysis of the Government’s oil and gas policy. all advice to you or other ministers from Treasury, MBIE, MfE or other relevant departments on the effect on New Zealand and global CO2 and CO2 equivalent emissions of the new oil and gas policy announced by the Government last week. This includes short-term, medium-term and long-term effects. I have been advised verbally by MfE that not exploring for more oil and gas would prevent emissions from oil and gas rising any further than they would anyway if all known reserves of oil and gas are burnt. I cannot speak for other ministers. It took over three weeks to effectively say ‘none’. What Shaw has responded with is vague verbal waffle. More important is what Shaw doesn’t say – this indicates he received no advice on the short term, medium term or long term effects of the oil and gas policy announced by the Government last month. The Green Party is heralding today’s announcement ending new fossil fuel exploration in New Zealand’s oceans as a massive step towards a stable climate and to protecting our marine life and beaches. “The Green Party and thousands of New Zealanders have been working for decades towards this day and this decision – that fossil fuels are not our future,” said Green Party Co-leader James Shaw. “Ending deep sea oil and gas exploration has long been a key goal of the Green Party and today, in Government, we’ve delivered on it. “This is truly the nuclear free moment of our generation, and the beginning of a new and exciting future for Aotearoa New Zealand,” said Mr Shaw. The Green Party have been working for decades towards this, however Shaw effectively admits he has received no advice from any Government department on the effect on New Zealand of the policy.